The duty-free policy in China's southernmost province of Hainan will be further eased from December, to boost tourism and domestic consumption as the island targets to be a free-trade port. Domestic and overseas tourists, as well as island residents can make duty-free purchases if they spend no more than 30,000 yuan ($4,315) per person within one year, up from the current limit of 16,000 yuan, the Ministry of Finance said in a statement on its website. There will be no restrictions on purchase frequency. Some medical apparatus and instruments will be included on the duty-free product list, including hearing aids, visual training machines, and household respiratory support equipment. Every consumer can buy a maximum of two of these items each time, according to the statement. Further easing the tax policy in Hainan is expected to spur domestic tourism and boost consumption of overseas goods and luxury items, Wang Huiping, deputy director of the Hainan provincial finance department, said at a news conference after the ministry announced the policy. The news cheered investors in the stock markets. Hainanconcept A shares surged on Wednesday afternoon and drove the Shanghai Composite Index back above 2600 points before the close, while Hainan Haiqi Transportation Group Co Ltd and Hainan Strait Shipping Co Ltd both increased to the 10 percent daily trading limit. The updated scheme will take effect from Dec 1, the ministry said. This will be the fifth adjustment of the island province's duty-free policy since the authorities started a pilot tax refund program in Hainan on Jan 1, 2011. Starting from April 2011, visitors to the island could have tax rebates with a purchase limit of 5,000 yuan. The cap was raised to 8,000 yuan in November 2012 and 16,000 yuan in February 2016. "After each adjustment of the tax policy during the past seven years, duty-free sales increased by more than 20 percent, indicating the policy effects are remarkable," said Wang from the Hainan finance department. According to data from the provincial government, purchases of duty-free products in the province totaled 7.95 billion yuan from January to October, up 23 percent year-on-year. Duty-free sales reached 8.016 billion yuan last year, up 32 percent from 2016. 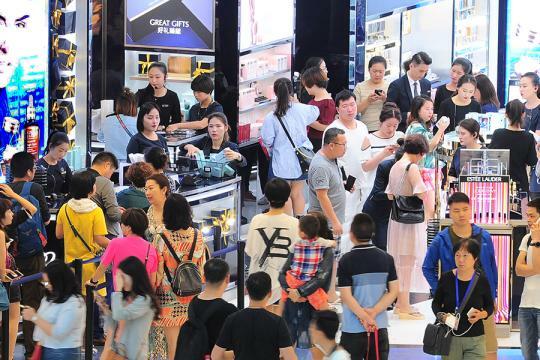 More than 12 million tourists have purchased duty-free products worth 38.5 billion yuan from April 20, 2011, to the end of October this year, the official said. Liu Shangxi, head of the Chinese Academy of Fiscal Sciences, said that the new policy will see more Chinese consumers buying goods from Hainan rather than overseas, and accelerate the service sector's development, in fields such as transportation, accommodation, catering and warehouse logistics.